I reported in a Angry Amateur No 2 that most of my websites are banned in Morrisons supermarkets. Most other websites are available even protest sites like Making Workers Pay or The Canary, a left wing site which The Sun has accused of spreading fake news. With most of my other sites blocked, this looks personal – but why? I am a bit paranoid but there are some out there that want to censor my views (and, of course, other more important views) but imagine my surprise when I discovered that the Overseas Development Institute seems to have joined in. We can take a lot of the carbon out of our energy. In particular, we can pretty much totally decarbonise our electricity generation. UK electricity generation currently puts out something like 550gm of CO2 per KW hour. We believe it’s possible to get to a low of 100g/KwHour by 2030 and 10-20g/KwHour by 2050. That is important not only to take the co2 out of electricity generation but because once we have done that it’s highly likely that we would apply electricity to a wider set of economiv activities than we do at the moment,largely electrifying the light end of surface transport cars and vans and probably putting electric heating back into our houses having spent the last 30 years taking it out. The “last 30 years” referred to the arrival of natural gas from the North Sea that was introduced into UK homes between 1967 and 1977. I saw this as a welcome but unexpected “gas must go” statement. I argued with [Lord Turner] about half way through the Q&A … listen to the MP3! I’d forgotten that so I tried to listen to the mp3 file of the talk again but the original had been removed from the website. However, on the web page for that event there are now several recordings – including Lord Turner’s speech but the Q&A session is absent. Initially, I thought was that the Q&A was cut for good editorial reasons but just to check I looked to see if I had downloaded the original recording of Lord Turner’s talk, which would have included the original Q&A. I didn’t find the original but I found something more interesting. It was a recording with filename “440-2-adair-turner.mp3”. On playing this I find that after 29m 57s as the audience was applauding his speech the recording goes blank. It resumes at 43m 45s with John Battle MP introducing another speaker. Production-based emissions take place “within national territory and offshore areas over which the country has jurisdiction”. Consumption-based emissions encompass those emissions from domestic final consumption and those caused by the production of its imports. The UK “leading the way”? Perhaps not! 3. Emissions of greenhouse gases for the UK? Government sources estimate that the average UK citizen is responsible for approximately 11 tonnes of greenhouse gases, measured as carbon dioxide equivalent (CO2e). This excludes international air travel, international shipping and the emissions of greenhouse gases generated when goods are manufactured overseas which are subsequently imported into the UK. Mike Berners-Lee, of Small World Consulting Ltd, has used input-output analysis to make estimates of the missing elements. He says of his, yet unpublished, work The UK’s imports account for a very significant proportion of its greenhouse gas footprint. Input-output analysis is a useful tool for estimating this, although it is very difficult make accurate assessments. Our modeling indicates that when the relative greenhouse gas efficiency of overseas industries is taken into account, (along with international transport and an appropriate treatment of radiating forcing from high altitude emissions) the UK’s imports account for 30 to 50% of its greenhouse gas footprint. This would put emissions at about 20 tonnes CO2e for each UK citizen. 3.1 Does the CCC think this is near the correct figure, when these extra sources are included? Q3.1: The CCC is unable to comment on unpublished work. The UK carbon budgets are on a ‘production’ basis, i.e. they refer to gases emitted directly by the UK net of any carbon credit trading. UK emissions on this basis were slightly under 11MtCO2e per capita in 2006 excluding international aviation and shipping (IAS), and slightly over 11MtCO2e including IAS on a bunker fuels basis. We have not attempted to measure the UK’s emissions on a ‘consumption’ basis. Later, at Ecobuild 2013, I questioned Ed Davey, then Secretary of State for the Department of Energy and Climate Change, if we could really be proud of our record because our consumption emissions (sometime called our carbon footprint) showed little difference. His reply was that when summed world wide they were the same thing. Isn’t that what scholars call a non-sequitur? To his credit, he did seem a rather rattled. On occasions, the Committee on Climate Change has been a little bit more open and honest on this topic: Just a little, it’s not in their headlines. In 2013, it produced a report, Reducing the UK’s carbon footprint, which seriously adressed this issue i.e. it showed our consumption emissions were not really reducing. The keynote speaker, Baroness Brown of Cambridge, highlighted the links between climate change and economic growth. She began by looking at the good news: Greenhouse gas emissions down, UK GDP rising. She emphasised that power is a “low hanging fruit” in making further transformative change, closely followed by infrastructure and transport. Baroness Brown is certainly right in saying that power is a “low hanging fruit”: The “dash for gas”, changed electricity generation from coal to gas – accounting for much of the UK’s reduction in production emissions. At the end of the presentation, I asked about the UK’s consumption emissions as published by the Committee on Climate Change (e.g. in Reducing the UK’s carbon footprint). In answering, Baroness Brown said that in the long run, as countries converged in their production emissions, consumption emissions would converge as well: Then there would be little difference between consumption and production emissions across countries. The same non-sequitur that Ed Davey used in 2013. (See Appendix for my letter to the CCC.). I wonder if that was Lord Turner’s reply was something similar in the “censored” Q&A session? I don’t know whether to feel shamed or privileged to be censored by the good people of the Overseas Development Institute. Must ask Ezekiel. On Wednesday I attended “Britain’s role in the global transition to a zero-carbon economy” at the Royal Society, where Baroness Brown was the keynote speaker. She gave an informative presentation, in which she said that climate change mitigation could drive economic growth. One of her first slides was a graph of UK economic growth and greenhouse gas emissions from 1990 to 2016. The slide showed economic output rising and greenhouse gas emissions falling. As I remember Baroness Brown used this to emphasise that it was possible to have economic growth and at the same time have falling greenhouse gas emissions at a sufficient rate to avoid dangerous climate change. She also made the point that the UK’s carbon emissions per capita were coming down to the global average. At the end of the presentation, I asked about the UK’s consumption emissions as published by the Committee on Climate Change (e.g. in Reducing the UK’s carbon footprint). In answering, Baroness Brown indicated that in the long run, as countries converged in their production emissions, consumption emissions would converge as well: Then there would be little difference between consumption and production emissions across countries. According to Reducing the UK’s carbon footprint, consumption emissions did not fall over the period 1990 to 2010. Defra has commissioned similar work (e.g. 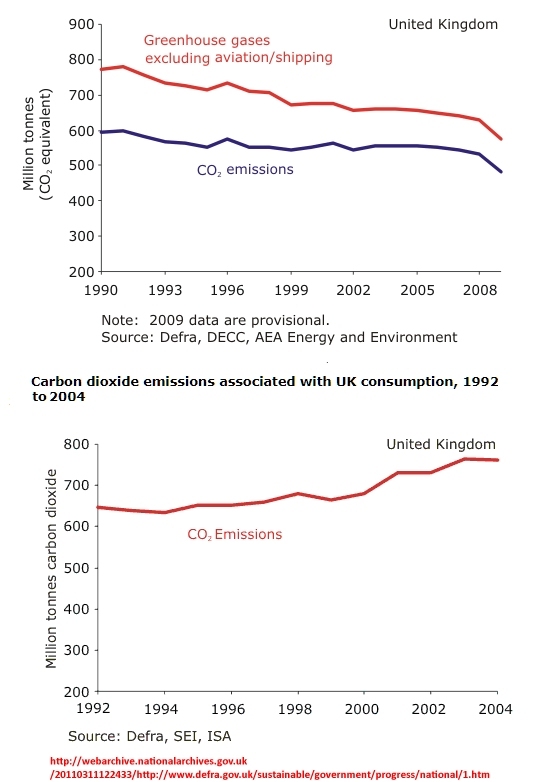 UK’s Carbon Footprint 1997 – 2013). This shows a similar picture for the years 1997 to 2013: consumption emissions hardly falling, although there was a drop at the time of the 2007/8 economic crash. As Baroness Brown’s very informative presentation pointed out, it may be difficult to maintain the rate of reduction of production based carbon emissions after coal is phased out of electricity generation. Will the Committee on Climate Change commission any work to estimate the effects of the ending of the “dash for gas” on emissions measured on a consumption basis? Does the Committee on Climate Change still have an interest in consumption emissions? If so how do they fit within its policy framework?